I found some cute little tarts at Whole Foods called, Hail Merry. They were egg-free, dairy-free, and raw but the first ingredient was agave nectar. I bought them anyway to see if I could make something similar minus the nasty fructose. Mine are tasty little treats that contain lots of good fats but no sugar. They can be dairy-free if made with coconut oil. Grease 2 mini-muffin pans (twelve-cup size) or 24 small tart pans. To make the crusts: In a medium bowl, combine the crust ingredients and mix well. Roll into balls and press into tart pans. It takes about 2 teaspoons of dough for each tart. Chill crusts until ready to fill. To make the filling: Place the butter or coconut oil and cashew butter into the bowl of a food processor or blender and process or beat with an electric mixer until very smooth. Add other filling ingredients and process until blended. Taste and add more lemon juice or sweetener as needed. Pour the filling into the crusts and chill for 30 minutes to set before serving. Garnish with lemon zest, if desired. Can be frozen. If you have extra filling, serve it as a delicious Lemon Pudding with whipped cream and berries or freeze it in mini-muffin pans or paper cupcake liners to make individual Lemon Fat Bombs. My tarts would have made a prettier picture if I had toasted the nuts, but they are more healthful with raw nuts. (The Omega-6 oils in nuts are fragile and are easily damaged when heated.) You could use nut meal rather than nut flour if you want the raw crusts to look brown. If you prefer the original version of this recipe, it is below. Only the filling is different. Place butter or coconut oil in a bowl and beat until fluffy or blend in a food processor. Add low-carb milk, lemon juice, sweetener, extracts, zest, and salt and beat or blend until mixture is smooth. Taste and add more lemon juice or sweetener as needed. Almond, Coconut, Dairy-free, egg-free, Fat Bomb, Lemon Tarts, Raw. Bookmark. Okay… how did you get the filling to blend? When you mix 1/2 c coconut oil with 1/3 c lemon juice… you get little blobs of oil dispersed in water. There’s no emulsifier in this recipe… color me skeptical, but I can’t see how one would end up with a “filling” from the list of ingredients. What did I miss? Jeff, This has been one of my most popular recipes and I haven’t heard that anyone had a problem with it. The bulk sweetener should make it thick enough to blend. Thanks for the comment! I used Swerve; maybe that’s not bulky enough 🙂 I put the filling in the fridge to chill and stirred it; while it’s still somewhat separated it was “together” enough to fill the crusts. Next time I’ll try whipping the coconut oil longer, and a different sweetener, to see what happens! Looks like I need to make this again and see if I have a mistake in the recipe. It’s been a while since I made it. I tried to make it today and that happened to me. I heated the filling mixture on the stove and it did blend together – I had previously tried both food processor and emulsifier blender. I added some cornstarch to the filling but it still was runny in the middle. I had to add more liquid to the crust recipe to get it to bind together. The taste was good but a lot of work for not a perfect product. I don’t remember having any problem, but I see that I need to recheck the recipe! Same thing for me. The filling didn’t come together smoothly, which as I was pouring into the bowl, I realized there wasn’t an emulsifier. Ended up melting it down to liquid, and chilling in fridge, stirring every so often. Once a little more solid, got it into cups. You might be using liquid coconut oil when you need solid coconut oil..? It seems like something is off in the recipe. I followed it to a “T” and the filling would not emulsify with the lemon juice. I used solid coconut oil. For the most part, they tasted great. Myra, I plan to retest the recipe. Have to get new supplies. Thanks for the feedback. For future reference – corn starch will only thicken something if it is allowed to come to a full-rolling boil. If you are trying to thicken without heat/excessive heat, then try a guar gum or xanthan gum type product – they work like a charm with VERY little product! Good luck! What did you do with the lemons on the top. Are those simply thinly sliced? They look candied in some way. I just used slices for garnish, but candied would be better! Just saute them in a little sweetener and water maybe? Is there something carb friendly I could use instead of grated coconut? My son won’t touch anything coconut. You could try using ground nuts. Thanks for the comment. I made this recipe except I didn’t have lemon extract so I used extra zest. It came out lovely. The filling doesn’t end up completely solid but firms up enough to scoop out of the pan onto a plate without it dripping. I used a vitamix and my sugar was a mixture of Xylitol, Erythritol, and Stevia. Hope that helps. They are yummy! Indeed it does help! Thanks, Melissa. I had the same problem with it separating and I used solid coconut oil. I’ve been out of my kitchen for a quite a while but am better now and will do some testing to see if I figure out what is wrong. The recipe worked for me, obviously, since I have pictures, but I don’t remember exactly what I did or which of the options I used. Meanwhile, you can fix it by adding 1/4 to 1/2 teaspoon of xanthan gum to the recipe. I made a batch this morning with coconut oil and it separated when I put it in the refrigerator. I’ll see if I can find my notes to see if I used butter rather than coconut oil when I originally made it. Thanks for the feedback! This recipe is not workable. Even after REALLY trying to get it to work the tarts were crude, had a terrible texture and were WAY too sour. I would NOT recommend this. Hi Bryan. You can fix “too sour” by adding more sweetener but I have no suggestions about it being “crude.” Thanks for the feedback. We *loved* the tart lemony flavor, And in the end, when chilled they’re very good. We will keep experimenting with ingredients and technique–it’s worth it! Thank you, logullojr. Be sure to let us know if you come up with a better version! I just made these. They were delicious! I put a tablespoon of almond flour in the filling and whipped it with the electric beater. It was a little difficult but kept mixing and they turned out great. Thanks for the tip, Pam!. I’ve been meaning to retest the recipe but haven’t done it yet. I like the almond flour idea. These turned out just lovely. Because of the comments I used a little less milk and a little more coconut oil! Thanks Lotte, for sharing! Glad they turned out well for you with your improvements. I did melt the coconut oil in advance… Me and my doughter loved them so much ? Absolutely yummie! Will be making new ones soon! Thanks so much for the comment! It is nice of you to take the time to let me know you enjoyed the recipe. 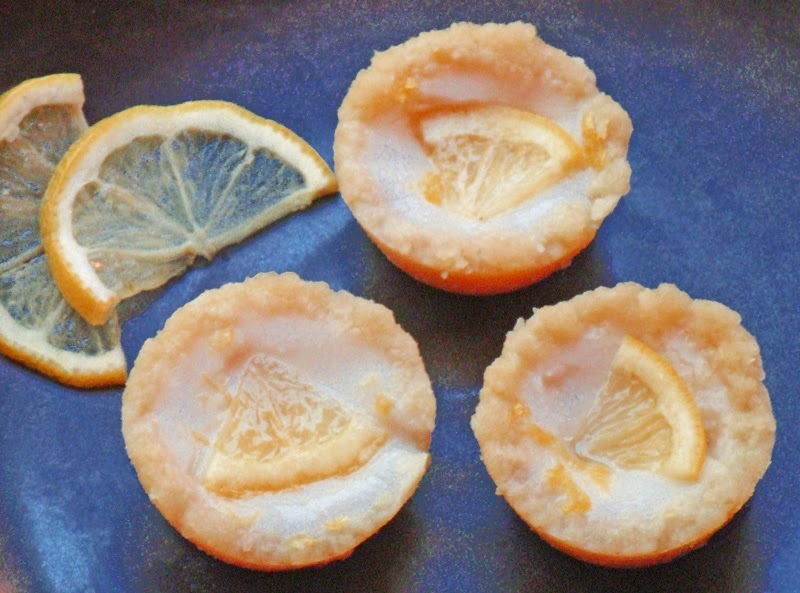 I will make these once I can get a couple of lemons for the zest. However, is it possible to use 1/8 tsp. of dry mustard as an emulsifier. I use the mustard in the liquid side before adding oil for making mustard. What do you think? Florence, Hmm, not sure I understand. Is this comment perhaps on the wrong post? I love too cook and bake. This kind of your recipe is new for me, I want to try this one pretty sure its delicious. Excited! I hope you like it, Sabrina! I also could not blend mine, so I drained the milk out and added about 1/4 cup cream cheese to bring it all together. Good idea, Joanne. I keep forgetting to go back and fix the problem. I know a little bit of Xanthan gum would do the trick, but cream cheese sounds good too! I have been retesting the recipe. I’m out of ingredients again, but will get back to it as soon as I get a new supply. I think I have a solution to the problem that people have been having! Thanks to all of you for your helpful suggestions! I would recommend taking this recipe down or making your edits to it immediately. So far it appears many of us are being mislead by what you’ve written and wasting our time and money. It is hard not to feel ignored when you post several times that you have yet to try out the recipe again. Maybe in the future you test your recipes more thoroughly before posting them. Disgruntled reader: I understand your frustration and am planning to replace the recipe today if I can. I am also behind on other posts that would explain what has been going on in my life. I’ve had some serious problems that have made it hard to accomplish much and also a surgery to correct a vision problem that made it difficult to use the computer. I’m starting a new protocol that I hope will help on both issues. Thanks for taking the time to revise your recipe! Despite earlier blending issues, my wife and I enjoyed the lemony goodness enough to make them twice. I look forward to giving them another go with your revised ingredients! Thanks, Jeff! Your comment cheers me up a lot. This is the best keto dessert I’ve had yet. I can’t describe how amazing these are. I read previous comments thinking I would need to add a bit of xanthan gum to get the filling to blend but it turned out incredible as is. I used a NutriBullet Pro, and used almond butter instead of cashew, I’m not sure what difference those made. Hi Sarah. I added a little cashew butter because some people complained that it was hard to get the ingredients to stay mixed. I had the same problem when I tried it using a stick blender. Hi again, Sarah Koenigs. I added the original recipe for the filling at the bottom under Notes. If you liked the old one, or if you are just curious about what changed, it is there now.